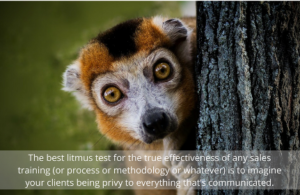 A few tips ago, I mentioned that I’ve always said the best litmus test for the true effectiveness of any sales training—or sales methodology or process or whatever—is to imagine your clients being privy to everything that’s communicated. E-v-e-r-y-t-h-i-n-g. Try this simple test to see how you fare. Consider your sales training materials and programs. What if you were sitting in a classroom and you turned around to find five of your best clients listening from the back of the room? Would this be a banner day or a bad day? So much of what’s taught in conventional sales training is trust-neutralizing, if not downright trust-degrading. You may not realize to what extent your curriculum objectifies clients, and/or teaches you how to manipulate them (even if it’s “benevolently”), until you examine the content from their point of view. Consider the decks you use at internal meetings. Specifically, take a peek at what you document in terms of accomplishments and goals. How would it feel for you if some or all of the slides landed in a client’s inbox? How would it feel for them? I still recall a slide belonging to one global client that defined their primary annual goal as dominating the market, with a secondary goal of providing exemplary client service. I suggested they switch the order to pass the trust-building test. Consider the everyday language you use internally. Do you routinely talk about “suspects” and “targets” (as in, “She’s a target”)? Do you coach each other on how to “get so-and-so to sign on the dotted line?” Ask yourself whether you would like to be spoken about in these ways. So many well-intended sales professionals (along with professionals who simply think they should be more sales savvy) use language every day that hurts the very relationships they are trying to build. Language matters—even if we only use it internally—because the words we choose both reflect and shape the way we think about things, including how we think about the very people we’re trying so mightily to serve. Be a hard grader on your team and your organization. How much of what you find is cringe-worthy, a source of pride, or somewhere in between? If trust-building is your aim, then do what needs to be done to pass the litmus test. This week, gather some samples of the items listed above and do a little hard-grading. What do you discover? 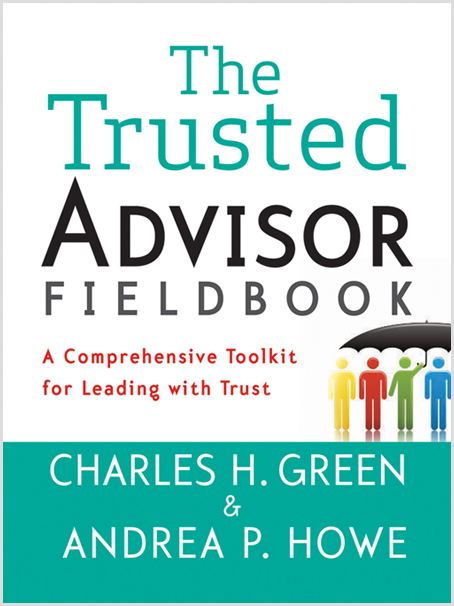 Read about fundamental shifts in mindsets and belief systems, from our friends at Trusted Advisor Associates, or brush up on how the four trust principles apply to marketing and business development in Chapter 11 of The Trusted Advisor Fieldbook.